It’s absolutely amazing what you can find on Pinterest! Cinnamah-Brosia checks it out regularly to find great treats for the Coffee Cottage. She knew we needed one for pomegranates and discovered this recipe for Pomegranate Orange Scones from Crunchy Creamy Sweet’s blog. They’re perfect for Cinnmah-Brosia’s guests, and they’re perfect for a group of your friends or family to share! 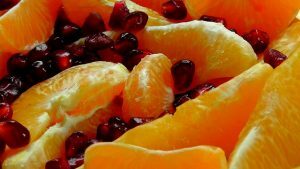 It’s the season for oranges, and pomegranates are still in season, too, for at least another month or so. They keep well. Stock up and make these treats all winter long.